Artburst Minis are integrative arts workshops for Early Years children and their parents/ carers that tour in 6 lead Children’s Centre’s around the Borough of Hackney and run during school term times. 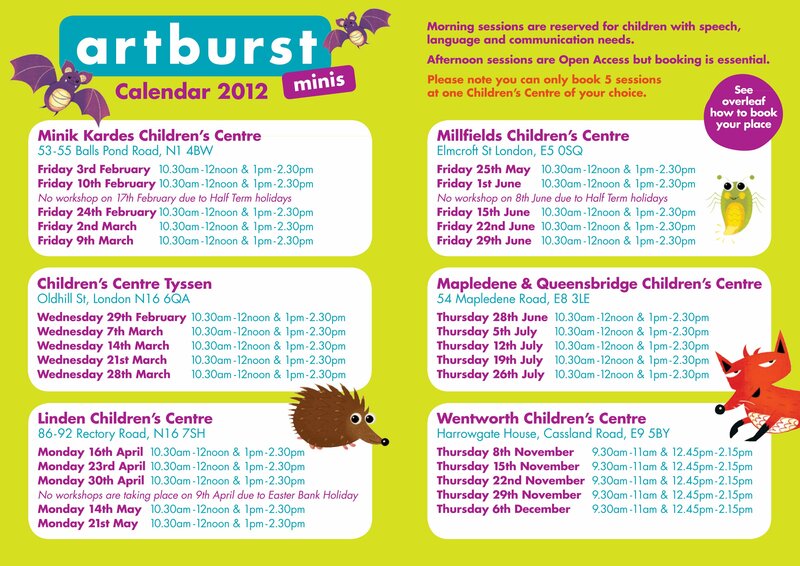 There are 20 spaces available for each block of Artburst Minis, with 10 spaces reserved for families with SLCN. The sessions involve storytelling, art, drama, music and movement with a Speech and Language Therapist present and Makaton signs used to reinforce language learning. Sessions are aimed at supporting children in developing their speaking and language skills before they begin school and in helping parents identify ways of supporting their child’s language learning.